Bread is a very simple thing. In its most basic form, it is a mixture of flour, water and salt. But this simple combination of ingredients is an ever changing product. For people all around the world it is a staple of cuisine. It goes from cheap and tasteless, crunchy and satisfying to the most complex flavour profiles taking days of careful and precise preparation. I have been making bread for about 15 years now but I would say that I have only been making ‘real bread’ for the last 7 years. There have been, and I’m sure will continue to be stages of my awakening to great bread. The first was while I was staging (a temporary work placement) in a 2 Michelin starred restaurant in Berkshire. It was there that I was introduced to ferment for the first time. 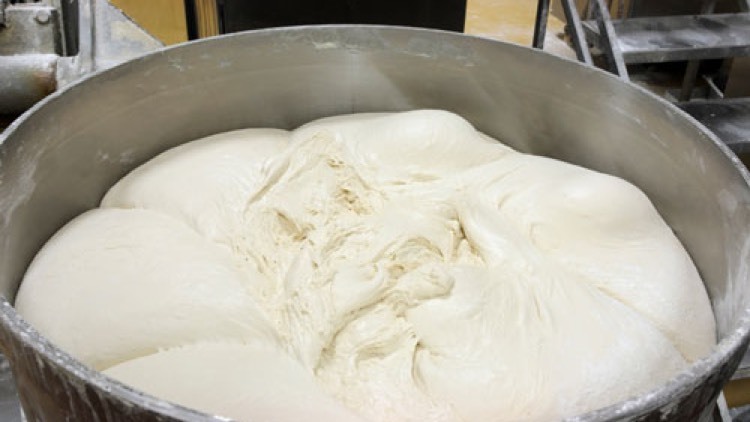 Ferment is a live natural bacteria made by the fermentation of flour and water. The wild yeasts on our hands and in the flour begin a fermentation process and once it is thriving it is constantly replenished and is used to provide sourness and a rising agent to dough’s. They have been in this process of fermentation for 15 years and I was quite shocked the first time I used it. The extremely sour and eye watering smell that was given off was new to me and I wasn’t sure what the result would be. It turns out the result was amazing! It gave the bread a beautiful depth of flavour and the crust was crunchy but chewy at the same time. I was hooked! I took this back to the kitchen I was working in at the time and started to experiment. This was the time that I realised that bread was an ever changing thing. My kitchen was colder than the one in Berkshire so the whole process of fermentation was slowed down. Our Systems of work had to be adjusted to fit this in but we did it and from that day onwards we would serve great bread every day, or so I thought! About a year later I went to a restaurant called St Johns and tried their famous sour dough and that was the day that I realised that the bread I had been making for 12 months was nothing but ok. I refocused my efforts to produce a loaf as good as the one I had in St Johns. It took a lot of trial and error. Different timings, temperatures, levels of steam, humidity, and techniques but we did it. But then, just as before I found the next level up and was crushed. Tartine in the mission district of San Francisco was a whole new level! As were the restaurants I idolised for their bread production were restaurants and therefore had other areas to concentrate on. Tartine was a bakery, all they did was bread and Chad Robertson, the owner had devoted his life to the pursuit of the perfect loaf. With an almost stalkerish motivation I became obsessed with trying to recreate this in my kitchen at the time; I like to think that I am getting close to it but if there is one thing that I have learned through all these years of obsession and toil. No matter how good I can get a loaf of bread, due to its constantly changing nature I will never get it to be the best. A hero of mine and culinary legend Thomas Keller once said that Perfection by its very nature is impossible to achieve, we can only strive towards it. I live in hope that maybe one day, I will get close.